Two playoff spots remain open entering the final race of the NASCAR Cup Series regular season, with Jimmie Johnson and Alex Bowman hoping to hold on to their No. 15 and No. 16 positions in the standings. The race is expected to take place on Monday. The Xfinity race will begin at 10 a.m., while the cup race will start at 2 p.m.
Johnson will automatically clinch if a repeat winner emerges victorious Sunday — or if a driver already in the top 16 wins. 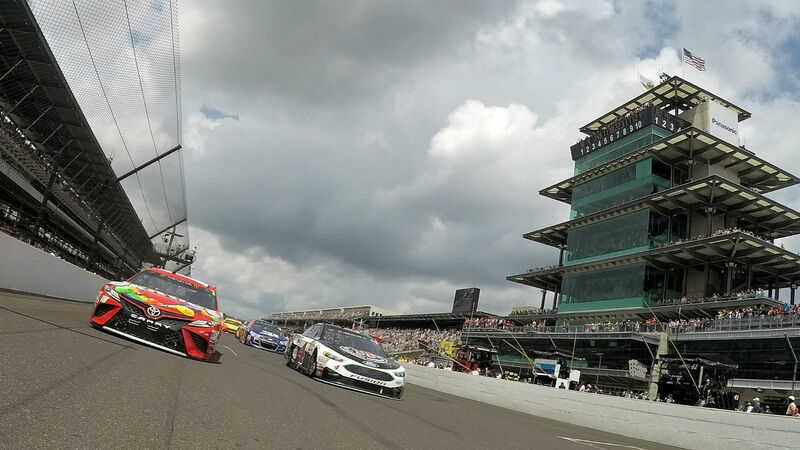 Meanwhile, if a new winner from outside the top 16 takes the checkered at the Brickyard, Bowman would need to out-point Johnson by 20 in order to clinch. 2:17 — Race officially posponed until tomorrow. 1:58 — Sounds like the race isn’t happening today, but no official word yet. Well poop.. This isn’t going to happen today. ???? Hopefully they let us all get to the hotels before the @Colts game ends downtown.. ?? 1:37 — Folks, it’s still wet and gross in Indianapolis, and there still isn’t an update on whether they will get this race in today. We’re already 20 minutes past the intended start time. 1:21 — Everyone in Indianapolis is just trying to stay entertained! Starting at QB for the NASCAR on NBC football team, @pkligerman! 12:59 — It’s crucial to have a dry period in order to get this thing started. 12:42 — There’s officially a delay with the wet conditions not letting up. 12:09 — Mist appears to be increasing right now. 11:48 — Wondering why Kasey Kahne isn’t here to defend his 2017 title? Read this story about dehydration and an elevated heart rate impacting his ability to compete. 11:39 — So far, the weather is cooperating. Let’s hope this holds up. 11:30 — We’re an hour and a half away from race time, and the drivers are locking in. There wasn’t any time for practice laps yesterday, but Chase Elliot isn’t worried.